On the back of the card I put a little blurb about the party and included maps of the park so the shelter I had reserved could be easily found. I also included that I didn’t want presents, which no one could understand. When asked why, it was difficult for me to explain in a way that anyone could understand, apparently. This party was more for the people that had been so supportive of me through out the pregnancy and with Rachel than it was a birthday party for Rachel. 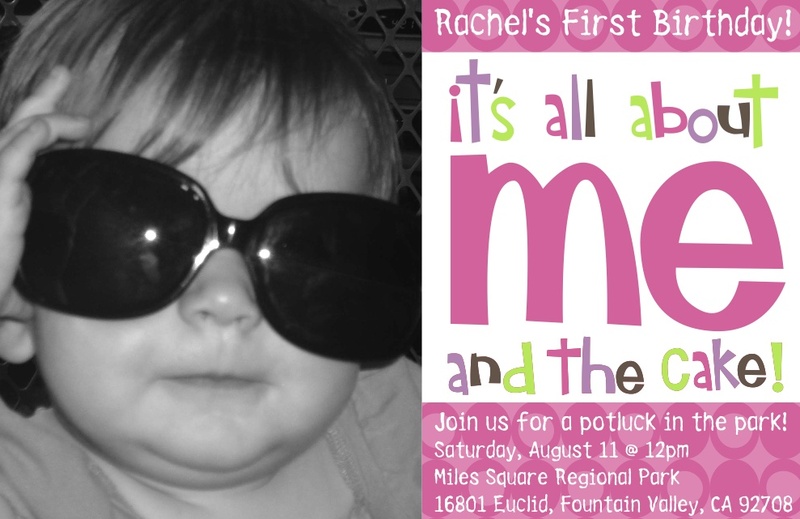 It had already upset me that I had to say it was a potluck because I couldn’t afford to feed everyone so I didn’t want people going out and spending more money on something that Rachel doesn’t really need, especially when they had all already given so much. Everyone said that they were giving her presents anyway. *shrug* Nothing I could do at that point. I tried. I had asked people to RSVP by the 5th of August, but since the invitations went out so late I would have been surprised if anyone did. A few actually did, which made me happy, and the rest I contacted during the week to see who was coming before I bought food. At night Joe and I made little carnations out of crepe paper and I had bought glasses at the dollar store to use as vases for them. I also put together bags of candy and toys for the kids to play with at the party. The night before the party, Joe had Rachel so I could do the preparations and get everything ready to go in the morning. He had done so much that there really wasn’t much for me to do at that point. The most time consuming thing would have been cutting up the fruit for the fruit platters and he did that on Friday, as well as cutting up the eggs he had hardboiled during the week and removing the yolks so all I had to do was make the yolk mix for the deviled eggs. I was exhausted from all the preparations and the stress of the birthday party during the week, and Heather had come over on Friday to help out but I didn’t think anything really needed to be done at that point. I had set my alarm so I would get up early in the morning to get things ready, load the car, and leave in time to get the birthday cake and make it to the shelter and start setting up by 10:30. Me and Heather hung out and chatted while I painted my nails for the occasion and when she left I went to bed. Of course when I hit snooze in the morning I accidentally turned off my alarm, so instead of being out of bed by 7, I woke up after 8:30 am. PANIC! It took me an hour to load the car which just the supplies and I cursed myself for not doing it the night before, at least everything that would have fit in the trunk! I made the yolk mix for the deviled eggs and took a shower. I didn’t have the time to get all dolled up, which I really wanted to do for the party, and this upset me but there was nothing I could do. I was running so late! I jetted out the door and raced to the bakery to pick up the birthdaycake. It had been really expensive but it was totally worth it. I got chills when I saw the final product. It was beautiful, it was perfect, it was a dream cake! The top was Vanilla with layers of whipped cream and strawberries, the bottom was Chocolate cake with layers of chocolate ganache and strawberries. I still am not clear on what chocolate ganache is, but it sure was yummy!! 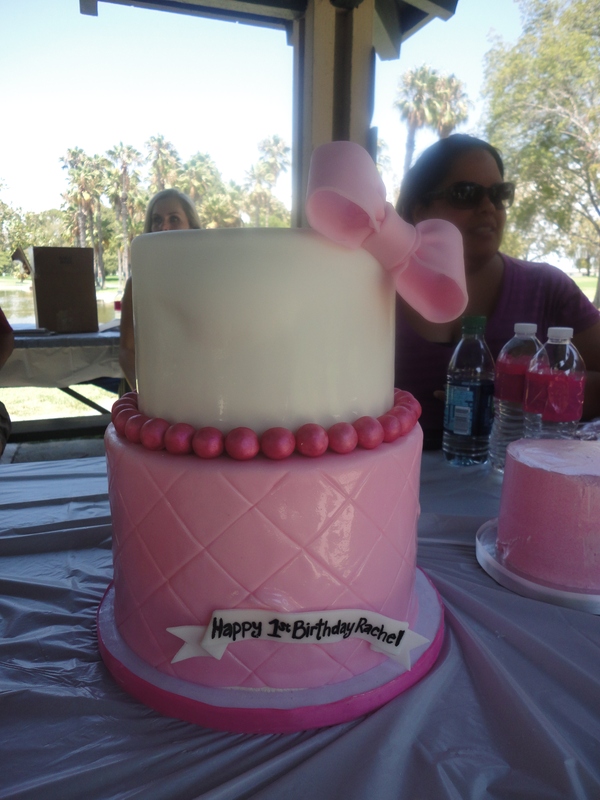 You can kind of see Rachel’s smash cake next to the cake, just a chocolate cake with pink frosting all for her. I was surprised it was so big; I don’t know why but I thought it would be smaller since it was for a baby. I wouldn’t have been able to eat it! The table of food that I had brought. Another table next to it was full of food that everyone else brought. I covered the food so flies wouldn’t get on it. When I pulled up it was almost 11am and Joe, Joey James, Rachel, and Heather were already there, and they helped me unpack the car and set everything up. I made the eggs there and set them in their trays, Cyndi showed up and put the cupcake holders in the cups and filled them with Chex mix for me. I cut up the cheese and salami for the meat/cheese tray and put the little pre-sliced bread next to them. I also put the fruit on the fruit platters. It didn’t turn out exactly how I wanted it to, but I don’t think it looked bad. While I basically brought snack food, people brought meal food: fried chicken, potato salad, hotdogs, hamburgers, fixings, we had more food than we needed. It all looked so good, but the stress and the heat of the day was getting to me and the headache I woke up with wasn’t going away. When I realized people were starting to show up I put Rachel in her birthday dress. She looked beautiful. I had brought her kiddie corral and the little ones that came enjoyed themselves inside it with the birthday girl. I wish I could say more about the party but the headache turned into a migraine and I don’t remember much. I knew I had just enough time to “enjoy” the party and see Rachel attack her cake, so at 2pm, after changing her out of her dress and into the clothes she was going to get frosting all over, we got everyone together and sang happy birthday to her. I wish I had taken a picture of that. Her face was bright and alive and she was smiling; she knew we were all singing to her and she loved every second of it. I watched her work at the cake for about 15 minutes, and the poor dear hadn’t even broke through the frosting to the actual cake yet! We didn’t have a high chair so we had put her in her stroller and put the cake on the tray. My migraine was starting to hit hard so I told everyone I had to go. I felt horrible, leaving everyone to deal with the mess, but I had to go to the pharmacy and get my medication before going home. When I left I saw my angel slumped down in her stroller and I watched her for a minute. Every little while, her hand would reach out to the cake, grab some frosting, shove it into her mouth, and then fall limp at her side. It was so funny, but I couldn’t stay to enjoy it. I left. The next Saturday was the Bakersfield party, and it was a lot more casual. I actually just texted the people that I wanted to go (which were few) two days before the party. I told them it was just cake, no lunch, nothing. Come, have cake, and enjoy Rachel. I also told them no presents, much for the same reason as before since this was family and my family has already given so much, but also because I didn’t want to carry a bunch of presents back home. My car is already full whenever we go up there. I joke that when we go to Bakersfield, we don’t so much visit as temporarily relocate! 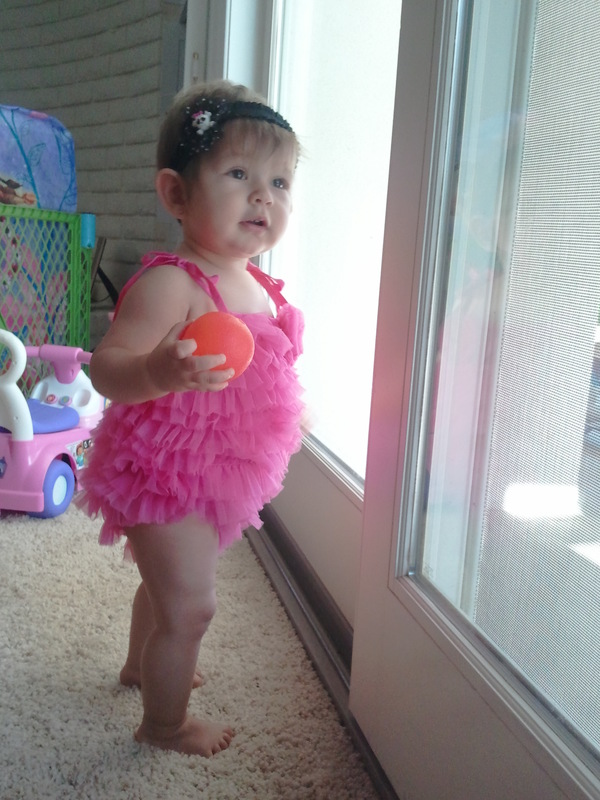 Rachel all ready for her second 1st birthday party! Rachel looked adorable, of course! People showed up at noon and had, of course, brought presents. Again, silly me! 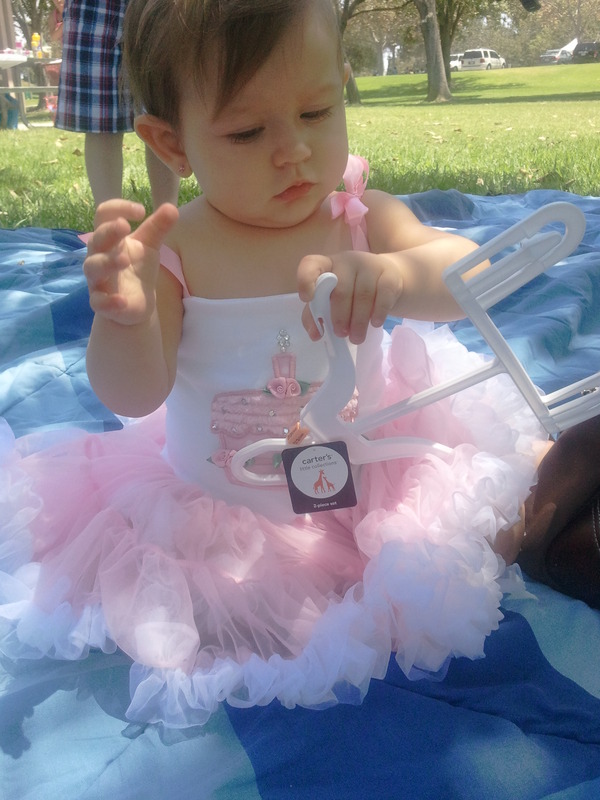 I put her in her birthday dress again, but she didn’t stay in it for very long. I was surprised to find that I really liked this outfit for her for the occasion, but I wanted everyone to see her beautiful birthday dress too. After the party was over she went right back into this outfit. Rachel is certainly spoiled, and not by just me. All in all I am glad that the festivities are over because that was more stress than I was ready for. Next year I don’t think I’m going to go all out like I did this year, and am definitely thinking somewhere indoors with air conditioning will be a must! I still can’t believe my baby is a year old now. It seems like just yesterday I was holding her for the first time. I knew it would go by fast, everyone said it would go by fast, I just didn’t know it would happen in a blink of an eye! 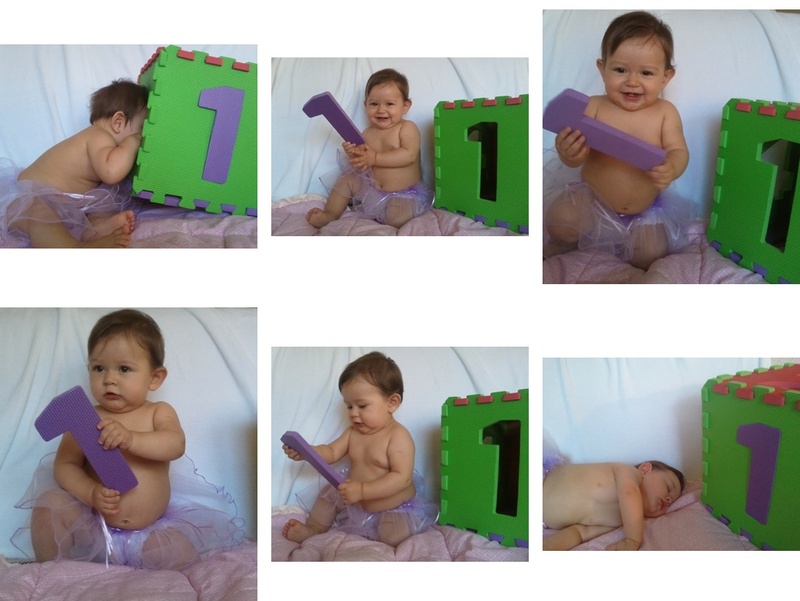 My little girl has learned to use her arms, learned to crawl, and learned to walk. She has learned she has a voice, then how to use her voice, and she has said her first word which I am proud to say was “Momma”. She is my heart and my soul. I’m hoping this year goes by just a little slower so I can take time to enjoy it a little more. This entry was posted in Celebration and tagged 1st birthday, birthday cake, Birthday Party, daughter, family, friends, migraine, smash cake. Bookmark the permalink. I love her dress where did you get it? I got it off of Etsy. The email for the person who made it is Pettiskirtfashions@gmail.com if you would like to contact her to see if she can make you one.